RUSH: You know, this is just despicable. This is… I don’t know what to do about it, other than call it out. CNN right now, I’m gonna read to you what’s on their screen. “West Wing Chaos.” “Trump Aides Defend his Mental Fitness and Deny He Is a Racist.” “Trump Goes on Tweet Binge Full of Insults, Attacks, TV Criticism.” Yeah, Trump is busy trying to defend the blasphemy and the slander and the libel that emanates from the Democrat Party and the media on a daily basis, multiple times a day. He fights back against it all. “White House in Chaos! Defends Trump’s Mental Fitness and Deny He’s a Racist!” This… I don’t know how to characterize this. This is despicable. They can’t figure out why Fox News in cable news is running circles around them — even though they’re livid about it, and doing their level best to try to destroy Fox. Not in the arena of competition, but in other ways. They’re seriously trying to attack and destroy the credibility of practically everybody that works there. You know something else? You know something else that does not happen? How many liberal Democrats as consultants and analysts has Fox hired? How many liberal Democrats are on that network every damn day and night? And does any of them, do any of them ever stand up and defend the network against these kind of charges? They do not. Not that I have ever seen. I even told Susan Estrich once, “How can you sit by…? This is the place that hires you. This is the place that hires you to tell the world what you think. You’ve got far more access to people/audience on Fox than you ever had on CNN. “Your party routinely attacks Fox where you are, and you never stand up and defend them. Yet they hired you, and you’re a liberal Democrat. You’re much more than that! You’ve run Democrat presidential campaigns.” (interruption) What did she say? “Well, da ba-da…” It was an email back and forth. I wasn’t talking to her, so she didn’t say much. But you can’t find one. Fox has hired whole bunch of liberal Democrats. In fact, they just announced today that they’ve hired Donna Brazile. I think I saw that. You know, today I’m in overload. I’ve got more stuff coming at me today… I don’t know if that’s a 2-year-old piece or if it happened today, but I think it’s today. I’m sorry to have to offer the caveat. But nobody but me has access to my incoming email. There’s nobody filtering it, and when it starts… Starting at about 11:30, you would not believe the stuff that starts flowing in here. And it goes… (interruption) Okay, good. And it goes on throughout the show. I get the equivalent of two shows of show prep during the program, and it’s exciting, and it’s thrilling. But, man, it’s tough to keep it all organized. (interruption) Okay. So I did see what I saw. Fox News has hired Donna Brazile, after Donna Brazile was funneling debate questions or town hall questions or whatever to Hillary Clinton during the presidential campaign of 2016. But my point is… I mean, this is just insidious. “Trump Goes on Rambling Tweet Binge While Running the Country.” What the hell does that mean? You people don’t let up! You people on CNN, 24/7 is nothing more than a permanent attack on the guy! And he’s not gonna sit here and let it go unanswered. We’ve known about this aspect of Trump ever since the presidential campaign began in 2015. (interruption) I thought it was a rehire. I thought Brazile had previously worked at Fox. It is a rehire. So CNN has just manufactured something out of nothing! Where is the chaos? Where is the chaos in the White House? Where has there ever been any evidence that Trump is a racist? Where has there ever been any evidence that Trump is mentally ill? There is no evidence for any of this, and yet now they’ve got “experts” on the air discussing Trump’s mental fitness and whether or not he’s really a white supremacist along with being a racist. It is. It is stunning that Trump’s approval numbers are what they are given this never-ending daily barrage, and he remains at over 90% approval in the Republican Party. RUSH: Now, I was gonna do Beto next ’cause I’ve got… (laughing) I was going through the headlines of the Beto stories with Mr. Snerdley before the program today, and they are a laugh riot. 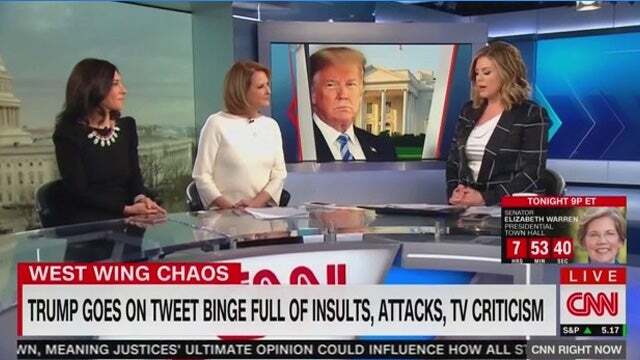 But there are other things, given what CNN is doing here, and I want to touch on them because they have to do with Trump’s popularity and his reelection chances that are looking good, and it is one of the reasons I think the left is ramping this stuff up. Because if the truth be known, it’s the left that’s in chaos, and it is the left that is fit to be tied, and it’s the left that is deranged, and it is the left that has become irrational — and I’ll tell you exactly why. It’s because they have failed to do any real harm or damage to Donald Trump, much less take him out. Now, I know I’ve said this a number of times. But I’m gonna say it one more time from the point of view that you have to understand how this affects their daily existence. In the minds of everybody that works at the New York Times, Washington Post, CNN — take your pick of any liberal news outlet — they have the power at their fingertips to destroy anybody they want. They have done it over and over again, and they believe they can do it whenever they want to do it. They usually train these efforts on Republicans, and they have succeeded in taking out many Republicans. They have succeeded in doing eternal reputational damage to many Republicans and conservatives. For example, among people who do not listen to me, my reputation is… Well, I wouldn’t say destroyed, but it’s been so bastardized. You who listen to this program, the millions and millions of you who do, know full well that all these assaults and attacks are lies. But the people that have never listened here who nevertheless know of me by way of media coverage… This how they do it. They never engage me on my ideas. They never attempt to debate me on my ideas or to cast doubts. They mischaracterize what I think. They impugn character and reputation among those they consider threats. Because, in truth, they are a minority, and the only way they can win is to bully and intimidate people into silence or inaction. Well, they’ve thrown everything they have at Donald Trump, and it hasn’t worked. Well, I can’t say it hasn’t worked. I think if Trump had been the recipient of even normal media coverage, that his approval numbers would handily be over 50%. He’d be at 55%. The Mueller investigation has done great damage even though not legally. It has permitted this never-ending, ongoing, two-year assault on Donald Trump as a cheat, as a fraud, as a foreign agent. The fact that Trump’s numbers remain as high as they are is a testament to Trump — and imagine you’re Trump. He just is not gonna sit there and take this stuff. So he fights back, and that immediately gives them the narrative that he’s losing his mind. Because in their world, when they attack you, you’re supposed to shut up like George W. Bush did. You’re supposed to shut up and you’re supposed to take it. That’s the rules of the game in Washington, D.C. If you’re a Republican and the media and the left decide to come after you, you have to take it. You do not fight back against it. They’ll get you even worse. Well, they’re sitting there in utter, total frustration at not being able to get rid of Trump. And they had so much wrapped up in this Mueller report. They had everything wrapped up in it. They were convinced in their minds that Trump was going to be gone by now. And the fact that they’re even having to consider Trump as the Republican nominee in 2020, it literally is driving them nuts. I think they’re the ones in chaos. I think they’re the ones losing their grip mentally. And I think CNN is a daily testament to the evidence of this. CNN is irrational, they’ve lost their grip, they have no contact with reality in any way, shape, manner, or form because their sole reason for existing is to destroy another human being, and they have failed at it, and it’s driving them crazy. ACOSTA: When I talk to White House officials privately, they will tell you, no, they don’t believe the president is insane, they believe he’s more crazy like a fox and that he sends out a lot of these tweets in an attempt to really dominate the news cycle, drive the narrative. And one thing that we saw over the weekend is there was a lot more discussion about General Motors, the way the president has responded to the terror attack in New Zealand, and not as much about the Russia investigation. And when you talk to White House officials, people who are close to the president privately, some of this is by design. He wants those tweets out there, he wants those distractions out there so we’re spending our time talking about those sorts of things and not about the thing that really strikes fear in the hearts of people inside this administration, and that’s the Special Counsel, Robert Mueller. RUSH: Well, wait a minute, Jim. How in the world do you conclude this guy’s insane if he’s outsmarting you this way? You just admit that Trump is enabling news coverage of things you don’t want to talk about. Trump is seeing to it that you’re not talking about Mueller. He’s seeing to it you’re not talking about the Russia investigation. So you think the Russia investigation is all that ought to matter and Trump’s not tweeting about it, so you go ask the White House if he’s insane? This question, “Jim, what does it say that the top aides are defending the president’s mental fitness and denying he’s –” What it says is that you people are making a bunch of baseless allegations to create a false news narrative! Doesn’t say anything else, pure and simple! And you’re bombing out here, apparently, in your effort.